← No Room to Move ! 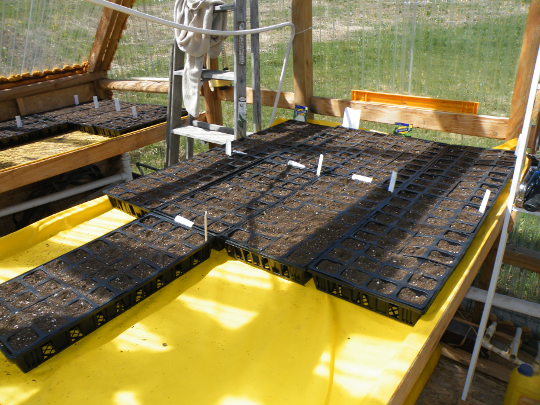 I’ve finally gotten started planting my cool weather crops in the greenhouse. 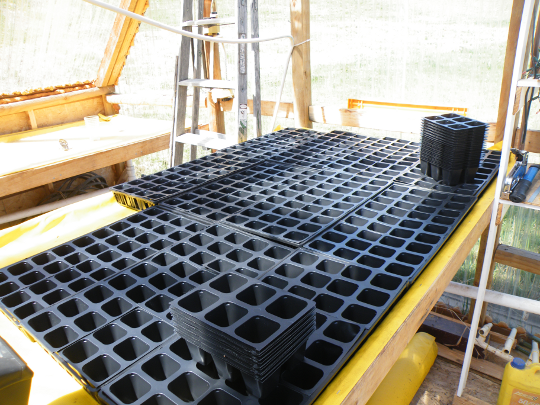 I’m a few days behind schedule, as I was waiting for my new planting cells to arrive. The cells cost a very pretty penny, and nearly broke the bank, but I do believe they will be worth the sacrifice. In total there are 40 flats with 36 cells in a flat. That’s enough for 1440 plants and the cells can be reused for years to come. They will be replacing my method of using styrofoam cups as planters, which will save me endless hours of poking holes in the cups and filling them with dirt. After George, Davey and I filled the cells with dirt, I got started planting some seeds. 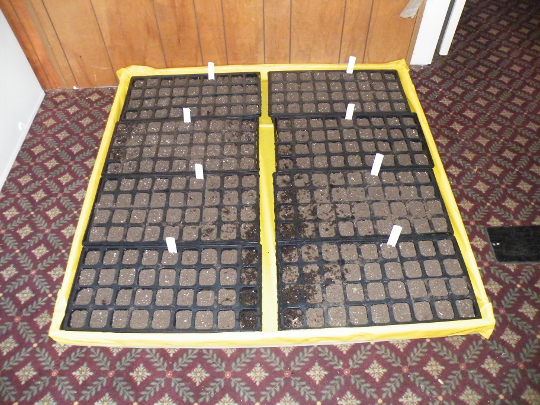 I was able to plant Broccoli, Cabbage, Brussels Sprouts, Spinach, and Cauliflower before running out of cool season vegetables seeds for indoor planting. I had just replaced the yellow liner in the water table shown, and when I filled it with water I quickly remembered the step I missed when I put the drain in the base. Somehow I forgot to use aquarium glue to keep the water from leaking around the drain, and since there was nothing stoping the water from leaking, I quickly had a mess on my hands. I moved all of the flats to another table, and began mopping my the water. Once I ran out of potting soil to plant in, I began working a few rows of soil by hand to plant kohlrabi, peas, endive and cool season lettuce. 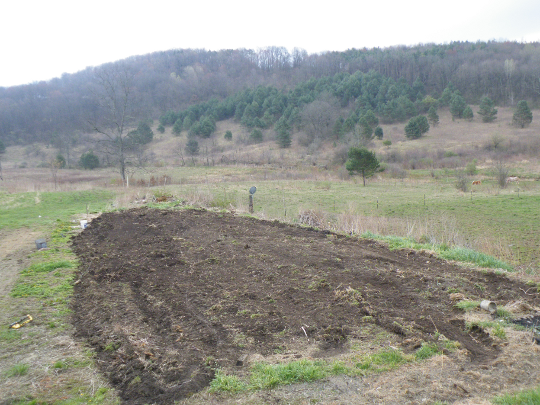 The ground is fertile, but has a good deal of clay soil in it, making it fairly difficult to dig in. 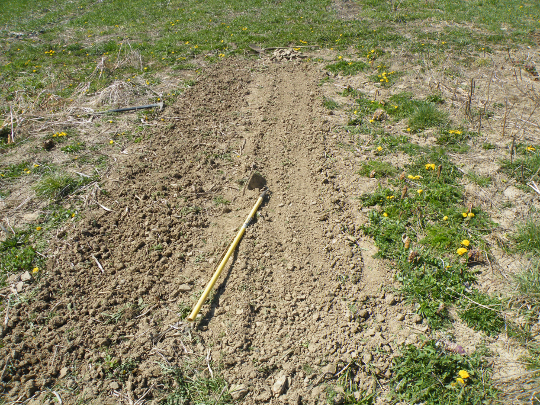 The two rows shown took a few hours to dig up and smash the soil. The work was difficult, but I soon had an idea that would save my back. I use the backblade on the tractor to dig and level dirt all the time, and I’ve gotten pretty good at it. I decided that it was worth a try to see how the blade would work the soil, and I was very suprised to see how effortlessly the blade ripped and pulverized the soil. This method required a bit more skill and certainly more time then a normal plow, but 15 minutes on a tractor far outways 50 minutes with a shovel ! 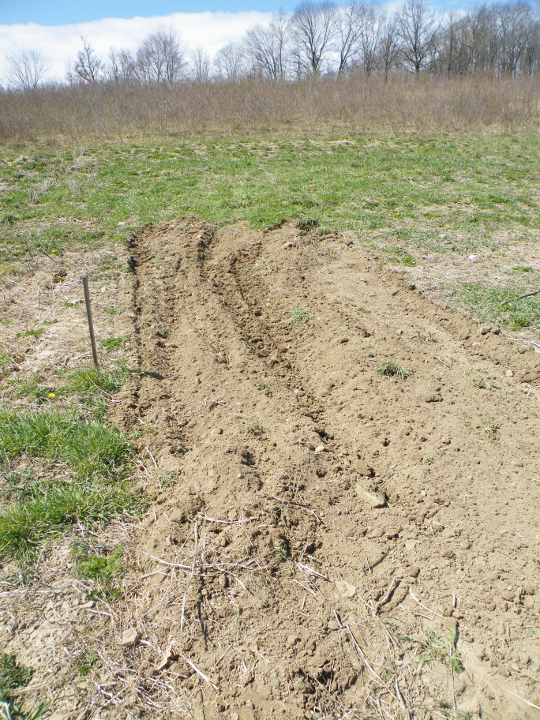 Once I saw that the blade would work well, I tilled up a 1/6 of the garden where I will continue planting cool season crops. One down side of the tractor is how it compresses the soil where the wheels roll, so I still have some shovel work to do. For those of you reading for the first time, I should mention that the garden runs from the spot where I took this picture to the row of trees in the background. I really should call it a field, rather then a garden. I soon moved onto the smaller garden, and made quick work of the soil there. 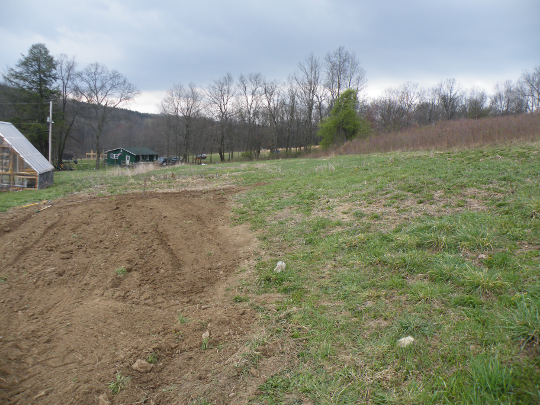 This dark earth is the product of massive amounts of manure rotting for years, and it’s the easiest soil to work with on the farm. Having two gardens may seem a bit off, but the varied soil, lighting and water conditions in each garden allow different crops to thrive. For example, cucumbers grew very poorly in the large garden but very well in the smaller one last year.